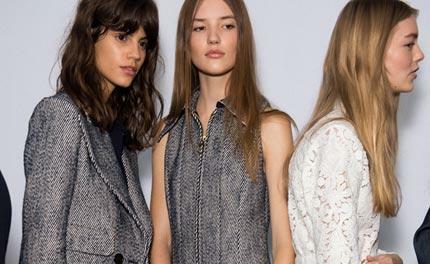 The Chloé show opened with a surge, striking right at the heart of what makes this iconic French brand tick along so briskly. Creative director Clare Waight-Keller delivered a run of peasant tops and short, feminine dresses crafted from crisp white lace patched jacquards that swung along with equal mixes of easy breezy nonchalance and feminine allure. It helped that she rooted the looks with a terrific lace-up suede gladiator - in either a knee length or mid calf version - featuring cool new wedgette heels. Thrown into this covetable mix were also safari dresses, flared shorts, jumpsuits and A-line pocket from dresses in stiffened materials that created a strong, clean line. The tailoring made it all feel new, as did her play with denim that created full length button-front pencil skirts as well as a hooded poncho and sweat pant combos crafted from dreamily soft denim washed knits. It wasn't radical fashion, per se, but that's exactly what Gaby Aghion (who passed away yesterday) had founded her label on in 1952. In that spirit, Waight-Keller accomplished what so few other designers have managed to do this season; that is, to create absolutely covetable clothes and accessories that could walk right off the runway and straight onto the shelves of a discerning woman's carefully considered closet.